Mang Da looks like over-sized, mutated cockroaches, but I can confirm that they’re not. 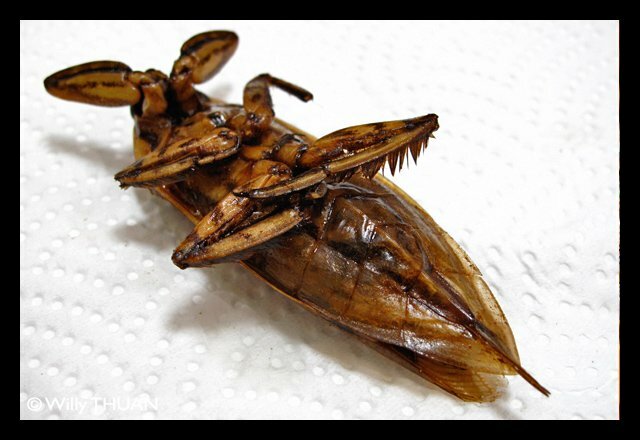 They are called Mang Da Na in Thai and apparently are the biggest kind water bug there are. 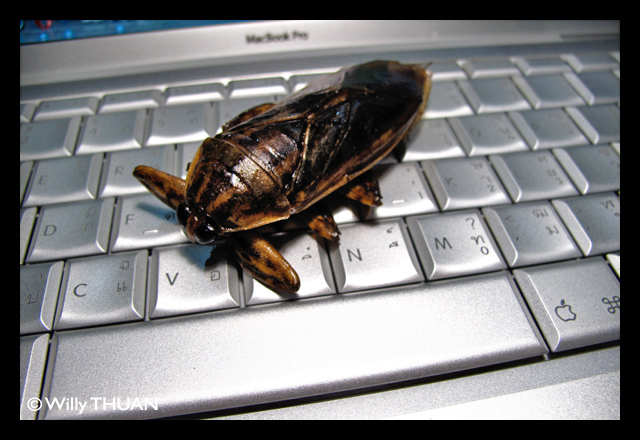 I think the English name is ‘Giant Water Bug’. These guys are not just another type of deep-fried bugs on the push carts. They’re a little more special than that. This is because male Mang Da has distinct fragrance that made them a nice ingredient for other Thai dishes; such as various Nam Prik or Chili Paste, Som Tam or Papaya Salad, and you’ll also find Nam Pla Mang Da or Fish Sauce with Mang Da fragrance. You can find boiled or steamed Mang Da in fresh market too, ready to go into Nam Prik or Thai Chili Paste dishes. Mang Da females are deep fried, while the males are used as an ingredient. 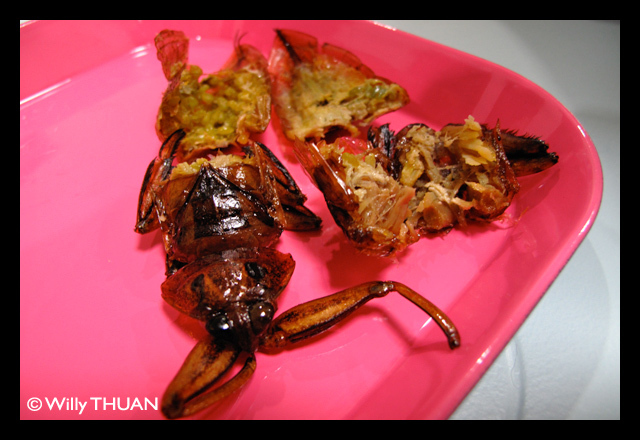 For the male Mang Da that goes into any other dishes, we usually chop the bug into small pieces. You might find a trace of black bits but the key thing is the fragrance and not the meat. How does it smell like? Candy or bubble gum. And jelly bean/Jelly Belly has that flavour! It’s really a special bug, see? Useful Tip: The word Mang Da is also a slang meaning Pimp. good luck using it. 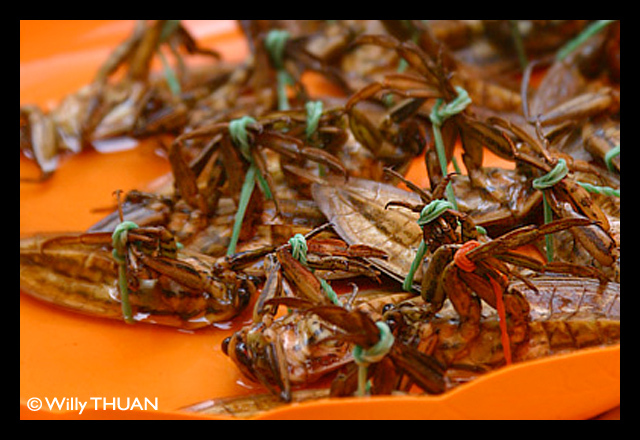 Where to find Mang Da: The insect itself can be found in local markets. 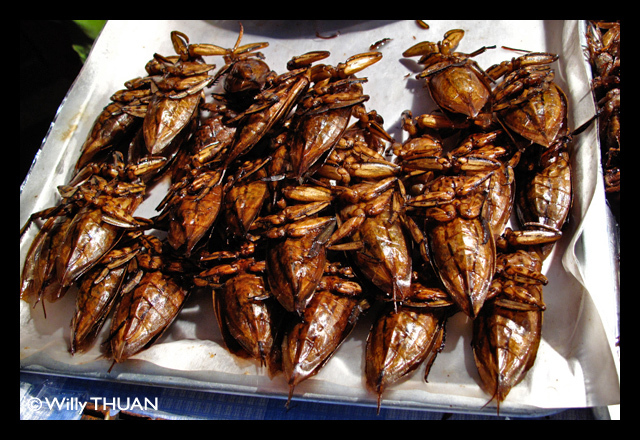 The push-carts are often selling deep-fried insects in tourist nightlife areas. 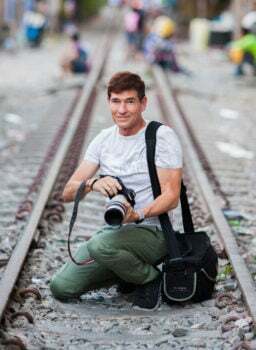 They’re popular for people working there and tourists alike. Nam Pla Mang Da and Nam Prik Mang Da fragrance can be found in supermarket easily. Some restaurants might have these Nam Prik Mang Da in the menu… but this is more popular in the Central and Northern of Thailand rather than here in Phuket. Many E-Sarn and North Eastern restaurants have Som Tam Mang Da.